Our economy runs on oil. Most of the tractors used for growing food run on oil. Nearly all of today’s cars and trucks run on oil. It is popular to talk about changing to some other fuel, but the practicalities are that any such change will be very slow. There is a huge cost associated with replacing cars and trucks with vehicles using other fuels, assuming we could figure out the technology to do this. 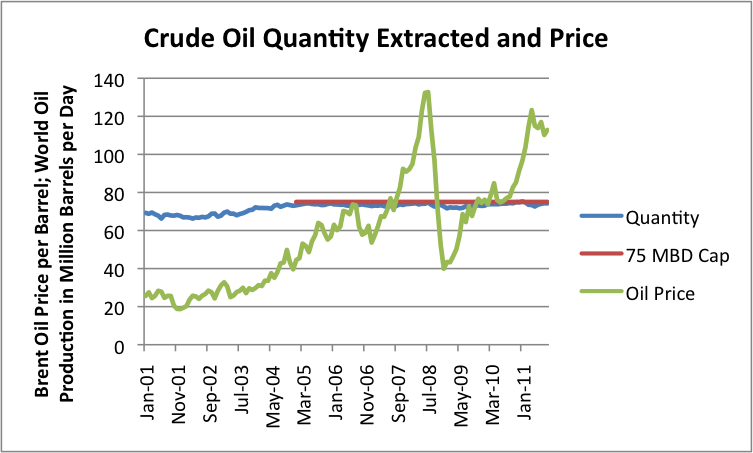 Since 2005, world crude oil supply has bumped up against what seems to be a limit of 75 million barrels of oil a day. No matter how hard companies try to extract more crude oil, and no matter how high world oil prices rise, they seem unable to extract more than 75 million barrels a day (MBD). The US Government is aware of this issue, and now issues data for Total Oil Supply. Total oil supply includes various other liquids that are somewhat like crude oil, including biofuels, natural gas liquids, and “refinery gain”. But even including the additional categories, growth in supply has been anemic. Oil prices started rising as early as 2004 because supply (whether defined as crude oil or more broadly) was not rising fast enough to meet increased demand around the world. With world oil supply virtually flat, countries have had to share what oil is available. Since 1985, there has been a big shift in which countries are the “winners” in the way the world’s limited oil supply is divided (Figure 2). Clearly the “winners” in the contest for who is able to buy the oil are the “Remainder” countries—countries like China and India and Korea, and the oil exporting nations. Over the period 1985 – 2010, the grouping “Europe, US, Japan, Australia” experienced an average real GDP growth rate of 2.4%; the Remainder group experienced an average growth rate of 4.7%. The Former Soviet Union experienced a peak to trough drop in real GDP of 41% after its breakup in 1991. 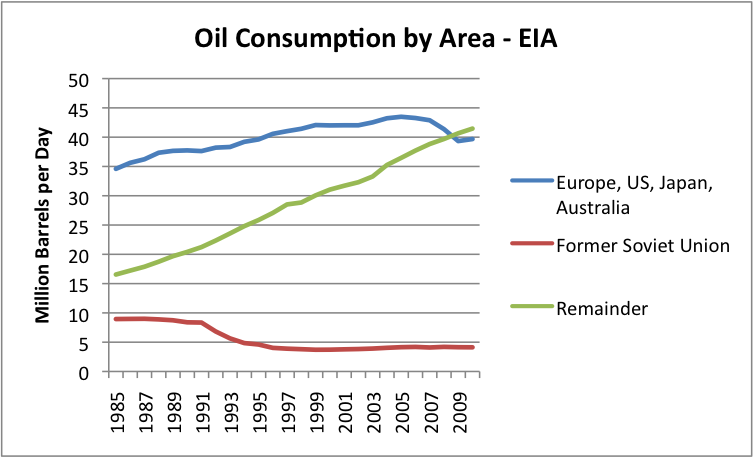 The grouping Europe, US, Japan, and Australia experienced a major dip in oil consumption and a serious recession in 2008-2009, while the Remainder countries continued to grow. High oil prices are clearly a problem for oil importing countries, because funds that would have been used for discretionary spending suddenly need to be used for necessities—food that is grown and transported using oil, and gasoline used for commuting to work. It is precisely the big oil importing countries that have tended to have a problem with reduced economic growth when oil prices are high. In my view, what the world needs now is inexpensive oil, and lots of it. What we need is enough inexpensive oil to bring oil prices back down to $20 to $30 dollars a barrel, like it was in the 2001 to 2003 period. If we had inexpensive oil in this large quantity, there would be plenty of oil to go around. It wouldn’t be only the oil exporters and the countries with large coal-based manufacturing industries that would be able to consume as much oil as they need for economic growth. Countries like Greece and Spain, which need low oil prices to stoke world tourism, would be able to consume their share of the oil as well. One issue is of concern is the connection between economic growth and debt. 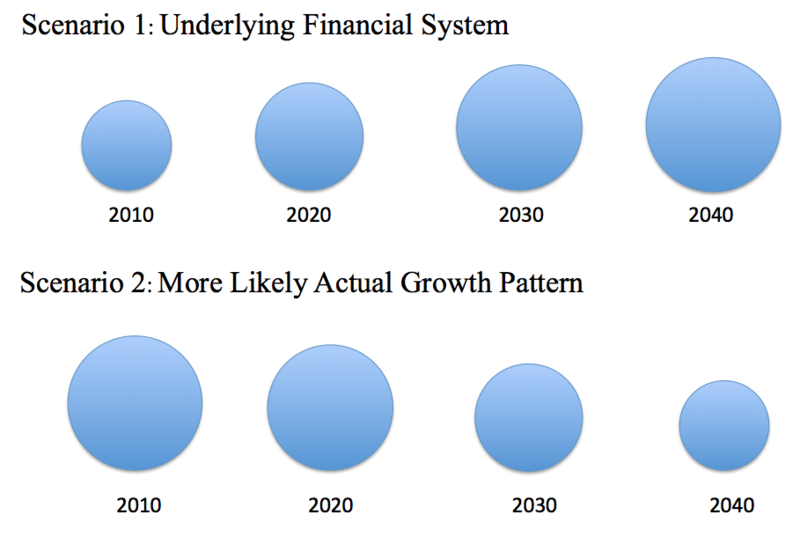 If an economy is growing, as in Scenario 1, it makes financial sense to borrow money, even if it is necessary to pay it back with interest. Borrowing makes it possible to “pre-spend” a little of the economic growth that will be available in the future. This relationship is especially important for governmental borrowing, but it also plays a role for private borrowing. If an economy is shrinking, it is hard to make a case for borrowing. In such a case, the future is likely to have less to offer than what we have today. This might happen if there is not enough oil to go around, and oil prices are very high (at least until recession hits). A great deal has been said about decoupling economic growth from natural resource use. It is not clear to what extent this really is possible. We can move manufacturing to the Far East, and pretend that the resource use isn’t ours, but on a world basis, during the past decade, energy use has been rising as fast as world real GDP. This has happened largely because Asian growth in energy use has offset savings elsewhere. Theoretically, if world oil supply is inadequate, we should be able to make substitutions that would work—either find a different liquid fuel to substitute for oil, or create new vehicles or machines that use a different source of energy than petroleum products. The problem is that making these substitutions is a slow, expensive process. We are currently using millions of cars, trucks, trains, airplanes, boats, and machines that require petroleum products to operate. Most of them are nowhere near the ends of their normal lives, so replacing them would be expensive. Liquid biofuels we have developed are expensive. To solve our problem, they really need to cost $20 or $30 dollars a barrel to make. What the world really needs now is a huge supply of inexpensive oil. It is not clear where we will find it, however. This entry was posted in Financial Implications, Introductory Post and tagged crude oil, debt defaults, economic growth, oil, oil consumption, oil limits, oil supply, petroleum, recession. Bookmark the permalink. (1) It takes a lot of non-human energy to grow the food to feed ourselves. Not true. Read Living The Good Life by Helen and Scott Nearing. Pay particular attention to their reasons for not using draft animals. (2) We have to have jobs. Forget it. There won’t be many paying jobs. (3) We have to be self-sufficient. Forget it. Humans are social animals and are designed to cooperate with others in small groups (e.g., tribes, extended families). (4) We have to pay back our debts. Forget it. The Revolution will happen one way or another. (5) We can live off our savings. Forget it. See number 4. (6) Our greatest assets are things we can count. Nope. Greatest assets are good health, willingness to work, ability to find pleasure in meaningful work, ability to produce the necessities of life, and a wide comfort zone (as opposed to a thermostat controlled environment). (7) Technology will save us. Nope. Technology has not made us any happier. Just more distracted. The Sermon on the Mount or Buddha’s great insights are just as valid as they ever were. I will admit that the transition period is going to be quite stressful. The French Revolution wasn’t fun after the first few days. You may be lucky or you may be unlucky. That’s just the way it is. Thanks! I am afraid I am not going to have time to read all of the books people recommend, but I did read some of the reviews of the Helen and Scott Nearing books. They sound like interesting folks, with some interesting views. I will tell you briefly about the Nearings. They started to subsistence farm during the Depression. First in Vermont, then in Maine. They developed a system which allowed them to work around 24 hours per week, with considerable travel in the winter months. They built buildings of stone because stone was maintenance free. They did not use draft animals because draft animals required food and human care (about a third of farmland was used to feed draft animals, at that time). They mostly ate what they grew. They did have a pickup truck, which they used to haul supplies from town. Their cash crop was maple sugar (boiled down maple syrup). Sugar, of course, is easily transported and easily stored. They believed that a communist community would be able to live more easily, but were never able to actually convince their Yankee neighbors to go along. So they were fundamentally self-sufficient while devoting a great deal of time to artistic and social pursuits. Both were in excellent health until they were over 90. Scott began to feel useless when he was over 95, and essentially starved himself to death. The Nearings became briefly famous in the 1970s when ‘back to the land’ people sought them out. Their books are out of print, but you can find used copies. They paid a great deal of attention to conservation of resources and maximizing the effectiveness of human labor. A team of oxen can plow one acre of land in 8 hours. Oxford University was named because it was at an oxen ford. Ox owners rented out the animals to local farmers and then did upkeep of the asset in winter in order to again generate rental revenue with them in spring planting and fall harvests. They were very expensive and farmers usually didn’t own them. They rented. In contrast, a 400 horsepower John Deere can plow that acre in 2.3 minutes. This is required for 7 billion people. The underlying assumption of the Limits to Growth is that we are limited to this planet. If we assume that we are limited to this planet then we will have to reverse all our moral principles. We must make death a sport, sexual perversion a virtue. We will have to make life a privilege not a right. Every infant must have be screened for defects. Only the perfect will be allowed to survive infancy. And then only on sufferance. Infanticide will become an art form. War has to be encouraged. Females have to be put on the front line as it is wombs that make babies. The more wombs we destroy the better. Faced with these realities, wouldn’t it be a good idea to re-investigate Dr Gerard O’Niell’s business plan to settle the Legrange Points 4 and 5? Or am I the only sane person on the entire planet? This is a moral imperative. To fail to embrace it is immoral. Please don’t whimper that it is all too hard. Such self-pitying writhings fill me with loathing. Perhaps the gulf that separates me from the rest is a species barrier. We will see you extinct. Arthur, you have succumbed to a tyrannical poverty of imagination that seems to be epidemic. Not least your locus on the other side of a “species barrier”? What? And, I’ll say, you seem to approach with relish and facility a ghoulish math dubbed “reality”. Bracing stuff. If this is what passes for Thinking, then there will be a fight, no doubt. Sending people into space is not a grand solution because it is not possible for any but a tiny number nor is it viable for any duration or for a price that may be paid; it will not relieve but exacerbate resource depletion and habitat destruction here, on our real home. It is in fact escapism and fantasy, an abrogation of genuine responsibility. Nuces relinquere…On second thought, let’s send any who wish to into the final frontier–you first. What’s hard is to think and act with modesty and restraint: use less, breed less and attempt a softer landing. It may not happen. But a worst-case scenario involves destroying utterly the conditions for life on this planet for us and every other species in service of dubious and plainly unattainable ends. I choose humanity, humans and Earth. I agree with you. The planet that has the most potential for supporting homo sapiens is called “Earth”. As much as I admire the work of Stephen Hawking, this idea that he supports space colonization is very ironic – what his is really saying is that humans on this planet are toast because of our stupidity – he is the ultimate defeatist in this regard. Truly ironic for a guy who has personally never accepted defeat from his afflictions. What else is ironic about the space colonization idea is the fact that any effort with even an infinitesimally small chance of working would require (at least) three things: 1- a recognition that humans are rapidly destroying planet earth. 2 – that preserving a tiny remnant of the human species on some distant planet was our best plan. 3 – that we would be willing to further destroy our resources here on earth to fund/enable this plan – a kind of last-ditch, hail-Mary sort of thing. I would think that if we collectively came to this sort of thinking we might also come up with plans to save planet earth instead of supporting the extraterrestrial crapshoot. I guess Arthur’s line of thinking says a lot about reason we are in this predicament. Valid points, well expressed, Dave! Anybody want to figure out the energy requirements of getting humans, plus the resources sufficient to support them in a style they would like to get accustomed to, to slip the surly bonds of Earth? All things considered, or at least all that can fit into my limited intellect, I find the bonds of earth to be a warm, loving embrace, not surly arrogance. Perhaps Arthur’s comment was intended as sarcasm, in which case what I’m about to say can be ignored. Both Dave’s have correctly expressed the flaw in any plan to save ourselves through escaping the Earth. The underlying principle of this plan is the same that requires such a plan in the first place, which goes something like this. “Oh well, we’ve buggered the planet so we’ll just throw it away and get another one.” Where does this story end? Do we ‘use up’ the next planet too and keep moving along, leaving a wake of destruction behind? Is that really the legacy we want to leave? If so, there’s not much point in existing at all. Sorry Arthur, I’ve seen our potential and having seen it, can’t be convinced otherwise. Human’s are not by nature as you’ve described. We’re just acting out a story that has exceeded it’s best before date. All stories have a beginning, middle and end. We’re seeing the end of this story and I plan to be involved in creating the new story of humanity, right here on Earth. Cue Margaret Sanger, cue the Eugenicists here. Population Reduction along Eugenics lines has untold political consequences to it, and its not even all that clear what you would want to select for either. In the near term, the economic drivers will determine the population reduction. Access to Medical Care will become restricted to only those with economic wherewithal to afford it, and ost Old folks will die earlier than they currently do in Industrialized countries. Similar Triage will occur amongst Infants, as those with extreme brith defects will not be supported. Both phenomena will make a dent in the current Birth-Death equation, but unlikely to be sufficient overall to reduce Global Population “naturally”. The next most logical reduction mechanism and that which is pursued by all cultures facing resource constraints is abandonign the Old People. Inuit up here in Alaska historically speaking would leave old folks to die by packing up and moving on while leaving them sleeping in their Igloos. A progressive age restriciton on medical care seems likely here which will reduce the burden of ageing people reuqiring extreme medical supports to stay alive. here in the FSofA, you probably could make the Medicare system solvent at the moment is you simply withdrew all Medical treatment for anyone 70 and older, and that is likely to occur down the line. In fact, getting any Medical treatment at all for anybody is going to become increasingly restricted. Just getting Insulin for diabetes problems will be hard. A diabetic with no access to Insulin dies fast. Most of the initial Die Off is liekly to come from the Oldest members of the society. As deprivation becomes more extreme, Infanticide will be the next method or population reduction. On both ends, you contract until you can reach a sustainable level. Its overall pretty fair, although those with more economic resources at the far end tend to live longer. Stil the collapse of complex medical interventions will make it ever more difficult for even the wealthy to buy the medical care nedcessary to live a life into the 80s and 90s. Unless there is a major Death Vector such as a massive Epidemic with high infection and mortality rates which intervenes, the population reduction will come mostly at the top end as old people are not supported, and some at the low end as infants are aborted or exposed as necessary. The Population will contract in this way until it can achieve a balance with the available resources. Its likely to take a while to play out in totality, and the absolute number at which it drops to is not determinable at this point. The progress though is..
As I say above, population reduction is best done via military force. This ensures the military winner is among the remaining 1 billion. A uniform die off of 6 billion people would be 263 million Americans dead, over a decade or two. This would put the US population at 53 million, about 1890’s level. There is no way in hell that any US politician of any party is going to tolerate this when he knows that he can achieve disproportionate American survival by simply suppressing competing oil consumption via military force. Die off is not likely to be uniform in any case. Its likely to hit the highest population zones with the least resources hardest. Japan, China and India are the most likely to take disproportionate amount die off. Utilizing military force doesn’t change the outcomes at all really, just changes the vector. In any case, the Ruskies and the Chinese will get in the act also and most of the big hardware will be down the bottom of Davey Jones Locker before the die off is even 1/2 complete.